Finally, a male timetraveller! I thought those became extinct in 2011 when Gong and BBJX came out. For all my love of female leads, it’s kind of exciting to finally get a male protagonist in a timetravelling internet novel adaptation, partly because all the female leads used their knowledge to juggle princes rather than the world. 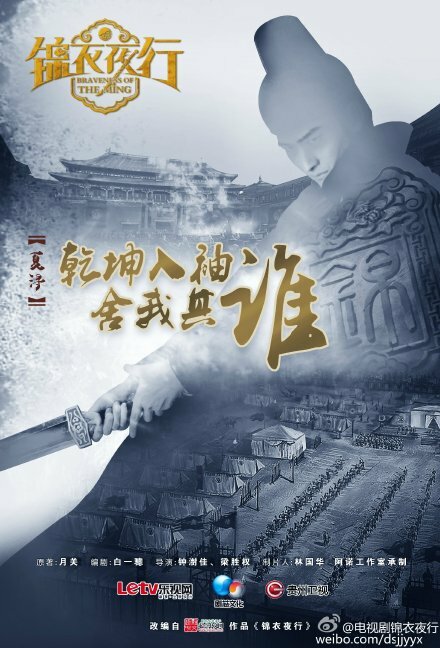 Croton Media (Boss & Me) and Juxin Media is set to adapt Braveness of the Ming 锦衣夜行, and has released its concept posters today, announcing its cast of Zhang Han, Park Min-young (City Hunter), Jones Xu Zhengxi, and Wei Qianxiang. Zhang Han would’ve been my top choice for this role, the rest of the cast is pretty, and Croton has never failed me yet, so I’m definitely psyched. This entry was posted in Drama, Mainland China and tagged Jones Xu Zhengxi, Park Min-young, Wei Qianxiang, Zhang Han by idarklight. Bookmark the permalink. Just I Love Park Min Young. A historical Chinese who looked like Park Min Young? Maybe Ming did have royal plastic surgeons. Love Zhanghan!! …AND Park Min Young! PMY is an incredible actress and Zhanghan makes any show great. So I’m a fan. Please keep us posted on this movie. I am glad that Suzy is not in. Her acting is still very limited. The difference in language will make her acting is more limited. Actually, I do not prefer Korean actress participating to the Chinese drama. But I think Suzy is better. I’m so glad that Suzy declined the offer to become female lead. I feel that she doesnt fit well into periode dramas. Park Min young has a face for periode drama and a good actress. She has some resembles to Janine Chang, I think she would be well received in China. Anyways So I’m looking forward to this drama, especially the Ming Dynasty setting!